This deck is one of my favorites. It has amazing come-back potential, great sticking power, and is very tricky for my opponents to deal with. It has come back from single digit life totals many times. What started as a silly Samurai tribal deck became a more powerful RW agro deck with a legendary sub theme. I went out of my way to find some goofy legendary lands and other permanents to go with that flavor. I made this deck back in Scars of Mirrodin block originally, so I’ve had plenty of time to tweak it. I’ve gone through 4 generals before settling on Iroas (I say ‘settle,’ but really he is way too powerful to ignore). The only one who got cut from the deck entirely was Jor Kadeen, the Prevailer. The previous generals Aurelia, the Warleader, Tajic, Blade of the Legion, and Agrus Kos, Wojek Veteran are all still present to lead the army in case of Iroas’ absence. The deck can maintain a low profile for a while, so in a multiplayer game it want draw attention right away. I’ll play some small creatures and Iroas to slowly increase my devotion. Then play one of the large devotion heavy spells (True Conviction and Nobilis of War come to mind) and swing at someone for a huge amount. It usually doesn’t kill the player, but it makes everyone else at the table switch to me as their main target (archenemy is always fun). Fending off three to four players at once with this deck really feels like a samurai taking on more several soldiers at once, making this deck an absolute blast to play. Even when it doesn’t go my way (which happens frequently) you can some really cool combat scenarios using Master Warcraft and some other combat tricks thanks in large part to Sunforger grabbing any instant I need. The only downside of this deck is that it can have very slow draws. It is very mana heavy and many of the legendary lands are too ‘durdly’ to be effective. They add to the flavor and fun of the deck, so I won’t be removing any in the forseeable future. I do have a list of silly lands to add though (Rath’s Edge would be a welcome addition). Hopefully you enjoyed this deck as much as I do. Warhammer is one of the most customizable hobbies in existence, which is one of the reasons so many people are drawn to it. There are so many different armies to choose from, and each of them possess their own unique lore and playstyle. In addition to that, each army has enough variance so that lists may be built in diverse ways to fit the players’ playstyle even more. To add even further to that, armies may be customized from proxying entire pieces, down to the sand that you decide to put on the base. Armies and models can be combined to make your army a unique as possible, and the colors that you paint them only serve to make the army even more a part of you. Warhammer is also quite an expensive hobby, as you may know. So choosing your army can be a big deal for most players. If you are a player who enjoys the thrill of winning, well, you might want to pick a versatile army which can hold its own against the even tougher codexes out there. You might enjoy building army lists. In that case you might want to pick an army with a variety of units that make it easy to build multiple unique lists. In any case, you don’t want to pick an army that you are not going to have fun with, or even relate to at all. It will make for a bad time with the game, and an even worse time with the hobby (which is where most of your time is spent). This being said, choosing an army can be integral part of how much fun you will have with the game in general. Feeling rather let-down by the Space Marines, I decided to give it one more go. I picked up a Blood Angels codex next, and started reading. This chapter spoke volumes to me, as it related to the hardships I endured in my life. Damned and dying, these marines fight every day for their survival individually, and for their chapter as a whole. They were cursed with an almost PTSD like, psychically-linked disease that plagues each marine who has been infused with the gene-seed of their glorious Primarch martyr. These angels of death are cursed with a Red-Thirst for blood, and a Black-Rage that inevitably drives every marine mad with an insatiable lust for blood. Once lost to rage the marines are forced into the ranks of the Death Company, who then adorn the distinguishable black armor that becomes their tomb, as they are sent to die gloriously in battle, or be slain by the Master Chaplain of their own chapter. Untrusted by their fellow Space Marine brothers, they fight onwards for the Imperium of man, ever-enduring, waiting for the day they might find a cure for The Flaw in their blood. The story of their Primarch (Commander of the Blood Angels) Sanguinius also spoke volumes to me. Sanguinius was not as “pure” as his brother Primarchs, because he was touched by the Warp (the lore’s version of dark-magic) as a child. 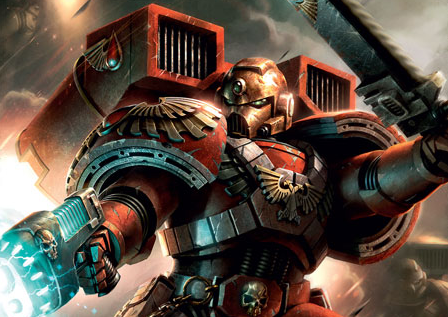 Due to this “tainting” he grew angelic wings which could carry him through the sky, possessed a ferocious might and skill rivaled by only the Emperor (leader of mankind) himself, and gift of foresight that allowed Sanguinius to see into the future. He was a friend to all, and an enemy only to those who made him. He was tempted by Chaos, but did not fall to its inducements. He was even able to see his own death at the hands of his brother Primarch Horus, and still gave his life willingly, knowing how important his death was to play in the Emperor’s victory. He fought on, no matter the odds, and did it with a certain grace and fury that commanded respect from all whom he knew. As a child I grew up in an alcoholic household, which left me scarred, broken, and angry. I too felt like there was a flaw in me, which drove me mad with anger. I used to get into fights, black-out in fits of rage, and was unreasonably aggressive with certain people. I related to the “Black-Rage” that the Blood Angels faced. The codex said that the Blood Angels were truly unmatched in their hand-to-hand skills, as they “fight like ones possessed.” As did I, thanks to the decade of martial arts training. Not only did I relate to their fury, but I also empathized with their unending struggle, and their unyielding strife to conquer themselves, and vanquish their flaw. And like Sanguinius I was determined, and truly was a friend to more that less. I was tempted to fall on my fair-share of occasions, but fought on valiantly even in the face of adversity, which previously was thought unconquerable. I fought to stay good and true, even with the knowledge and fear of the rage that dwelled within. Needless to say, I loved everything about the Blood Angels lore because of how I felt I could relate to it. Not to mention that most of their names and symbolizations are based in the Italian Renaissance which, as an Italian American, is awesome. I chose the Blood Angels all those years ago, and despite all of the “questionable” decisions Games-Workshop has made regarding the Blood Angels codex, I still play them today. I still love the blood-red army on the tabletop, and the lore for all of the same reasons. For some of you it may not need to be all that intimate. It could be as simple as “I like how that army uses battlesuits,” or “they look like skeleton robots, so cool,” or even just “orks orks orks orks…” No matter how you chose, my choice of army helped create the experience I had with the Warhammer hobby. So I urge all of you to keep that in mind when making your decision. Games Workshop’s (GW) newest game, Warhammer: Age of Sigmar (AoS), was released to very mixed reviews. Some people were willing to try out the drastically different game while others had a more explosive reaction. One of the key points of debate is the absence of points values for their models, a metric which has historically been used to balance two armies into roughly equivalent forces. Having spoken to a representative of the company to hear their defense of why they were abolished I spent some time pondering what felt off about it. In a nutshell, GW no longer wishes to put any sort of restriction on how players use their models. They confessed that none of the previous rule sets were 100% balanced and they do not endorse any of their games as being fully competitive. Over the years many of the games created by GW have been used in a competitive setting. Whether it’s in smaller more casual tournaments or the official ‘Ard Boyz tournaments sponsored by GW, people liked using their armies in a roughly fair setting. Recently though, they stopped supporting the tournament scene. They no longer host the ‘Ard Boyz events, they don’t provide prize support to smaller venues, and their rulesets are more open to having incredibly unbalanced army lists. Every codex, army book, and rule set which is released has a certain amount of backlash from the existing community over the differences between the new and the old. To combat this they went in the completely opposite direction for the new game. The core rules for AoS are very, very, simple. Instead of the 200+ page tome which normally accompanies a new edition of one of their games, AoS’ rules are 4 pages long. I really enjoyed this aspect of the game, but could not shake the feeling that something was missing. It occurred to me that outside of pre made campaign-style battles, there is actually no way to start playing a single game. Before AoS, to play a game both players would agree on a points total for their armies. Then the players would reference their army book, or codex, to create a list of models that was less than or equal to the agreed upon total. Each army had little quirks associated with them which gave them a unique feel which was incorporated into how you made lists. Some armies would be more elite, so they would have smaller units of models who were stronger than average. Others would be swarm armies; they would have many more models per unit. For AoS, there are no point value for the models. Creating a list of any kind is no longer possible. Players can grab any number of models for any number of units with no limitations of any kind. There are several suggested methods of balancing the games (starting with one boxes’ worth of models, or using the ‘wounds’ value to try and make points for the models), but in the rules pamphlet all it says is ‘you may use as many models from your collection as you wish.’ Games Workshop has said that they no longer want to put any sorts of limitations on what players may do with their models, but I believe this is not an effective method of making a game more fun. A large portion of many player’s enjoyment of the game comes from a sense of ‘fairness.’ No one thinks that the rules for all the armies are completely even, but they don’t need to be. They just need to be even enough. When testing AoS I looked into my case of Skaven models, then to my opponent’s Ogre Kingdoms force, back to my Skaven, and so on; and actually had no idea where to begin. Do I grab a handful of clan rats and toss them down? Do I grab only the largest models I can find? These questions are answered by GW with a slap on the back and a smile, “Do whatever you want!” What if I want to have a fair starting point? What if I don’t want to demolish my opponent easily or be demolished in turn? These things could potentially happen in any of the previous GW games, but they were mostly up to chance (i.e. dice rolls). One of the aspects of miniature games I enjoy is the duality between random chance and known quantities. While the amount of points a model is worth is constant, the effectiveness is not. A lone wounded soldier could take out an entire alien battalion, but it is very unlikely. Just as a whole squadron of machines could somehow miss that one Marine twiddling his thumbs out in the open. The inherent randomness of dice makes for very interesting and fun scenarios which occur naturally. AoS has removed the known quantities from the game. There is no longer any way to play a game on equal footing with an opponent, or even play a game separate from a larger campaign or story line. The random chance is still present, but now it is random chance piled ontop of random army combinations. Losing is never the most fun thing that can happen when playing a game. Losing in a previous GW game is particularly frustrating because of how long the games can take, but at least usually there were funny stories which came out of it. On top of that the losing player could ask themselves “What did I do wrong?” They could go back to their list and see what was not effective, see what worked well, and tweak their army for the next game they played. They could learn which upgrades were effective against which armies, they could see what was ‘too many points’ for a given upgrade, and they could learn how their army functions on the table. The equal starting point made it so that the players could generally know where the mistakes were made. Did they play the army poorly? Did they choose to attack the wrong target? These questions are reasonable and can turn a loss into an opportunity for growth. It is the known aspect of the game which acts as a grounding point for what went wrong. Without the point values for the models losing in AoS is just frustrating. I don’t claim to be a mathematician, but I can generally understand the logic of some theories. If you have 2 variables in an equation and one constant, then it is easier to figure out what the answer would be. In GW games, the two variables are list building and playing the game and the constant would the point values for the models. You can tweak the variables to find a winning combination and the constant gives you a sense of security. “At least I know my opponent is only bringing 2,000 points worth of stuff.” With all aspects of AoS being unknowns there is no sense of security. There are many interesting things that GW attempted with the AoS release. Most notably, they managed to successfully cater to both their old crowd and to new players. AoS replaced Warhammer: Fantasy, but GW put out updated rules for all the older models. They also made it so that the square bases from Fantasy are compatible with the round bases in AoS. On top of that, the rules are so light and easy to understand that new players won’t be intimidated away from trying out the game. All this would be great if there were a straightforward way to start a game. Without the points system all the other changes to me are irrelevant.